There is nothing like a real wood fire. In this age of glass-sealed gas fireplaces and frilly little plastic logs and worse—those videos of fireplaces—ewer homeowners are using real wood-burning fireplaces. Add to that increased local restrictions on the burning of wood, due to pollution concerns. From a safety and pollution standpoint then, it's good to have a plastic log with imaginary flames. From an emotional standpoint, they just don't cut it. There's nothing like the scent and crackle and heat of a fireplace burning hickory or oak. One dark secret about fireplace ashes is how long they remain hot and able to ignite other materials. Come back a full day later and the fire appears to be fully extinguished. Move those ashes to a flammable container (paper bag, box, etc.) and there is a very good chance that those ashes, which appear to be very cold, will start up a new fire. During Christmas 2011, in Stamford, CT, three girls were killed after fireplace ashes were improperly disposed of. Sarah, Lily, and Grace Badger, along with their grandparents, were killed in a Christmas morning fire. Michael Borcina, the boyfriend of the girls' mother, Madonna Badger, had placed the ashes (which turned out to be still-smoldering embers) in a bag and placed them in a mudroom of the house. These embers re-ignited and burned down the house. What Kind of Fireplace Ash Bucket? FEMA's U.S. Fire Administration advises that you dispose of fireplace ashes in a metal container and place them far away from your house or any other structure. You don't need to buy any special fireplace ash bucket. All you need is a standard-issue metal bucket with a locking lid, like the one shown above on the left. This 6-gallon Behrens bucket retails for around $16 at The Home Depot. You can buy a 31-gallon model for less than ten dollars more. They're ugly, but they work. 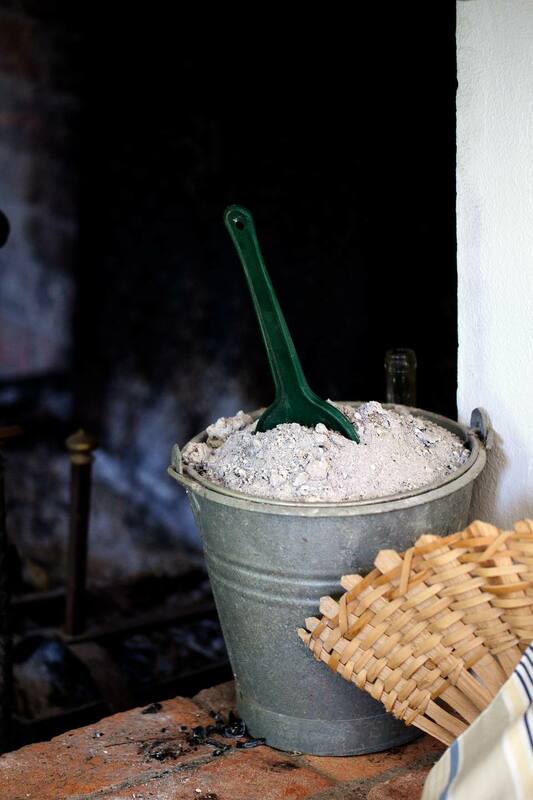 You can find some beautiful black and copper fireplace ash buckets from places like Plow & Hearth. Our theory is that ugly is better because it forces you to move the thing outside. An attractive ash bucket, by contrast, doesn't look half-bad sitting next to the fireplace. Will the Plow & Hearth can ignite flammable materials underneath? We don't know. Their advertising literature says that the cans' "double-layer steel bottom offers additional protection for floors." Even so, we prefer the added peace of mind that comes with having those supposedly cold, dead ashes far away from our house.